The matter has become political with the Congress president using the deal to repeatedly call the Prime Minister a thief. Despite Congress’s best efforts, the Rafale issue has not got traction among the voting public. The Congress and its friends were in a celebratory mode when the Supreme Court dismissed the Centre’s objections and agreed to rely upon three documents on Rafale that had been published by sections of the media. 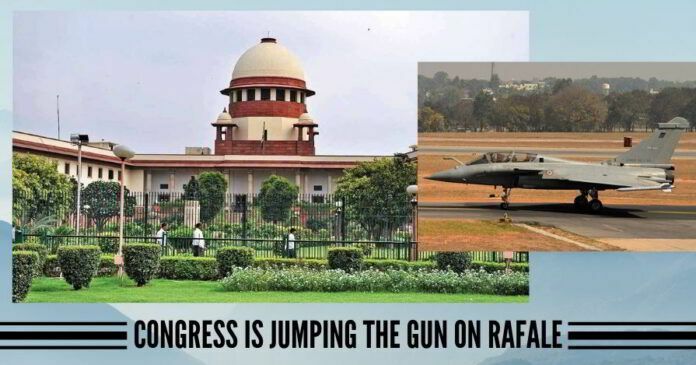 The court said it would consider the material in deciding on a review plea by petitioners on its earlier order which had given a clean chit to the Government on the fighter aircraft deal. Congress president Rahul Gandhi claimed that the court’s decision confirmed that the Chowkidar was a thief. everyone is free to publish sensitive material, and if, after the publication, it is found violative of the provisions by way of harming national interest or causing harm to relations with other countries, adequate legal steps could be taken against the offender. Congress is being mischievous. The apex court has only agreed to consider the published material as ‘evidence’. It has not said that the documents indict the Government. In fact, the three-judge Bench has not even said so far that it would review its earlier order. That decision has been left for a later date. And yet the Congress and its cohorts are jumping the gun. Even if one presumes for argument’s sake that the court at some date decided to have a relook of its earlier ruling which had cleared the government to government deal, that too would not automatically mean there had been some wrongdoing. The finality can come in the Congress’s favor only if the apex court were to rule that, based on these documents, the deal to purchase 36 Rafale jets was shady and should be scrapped. That said, the court’s April 10 order agreeing to admit the published documents was a setback to the Government. One wonders whether the line of argument that the Attorney General adopted was the most judicious one. He had broadly made the following points: One, that the documents were covered under the Official Secrets Act and thus the Government could claim privilege over them. Two, the material that has come into the public domain through a section of the media, had been sourced illegally. Three, the review petition could not be maintained on the basis of illegally sourced material, since the Indian Evidence Act did not permit it. And four, the Right to Information Act had provisions which provided exemptions from disclosure of sensitive material. The court found no trouble in trashing them. It said that Section 123 of the Indian Evidence Act related to unpublished documents; that the immunity from disclosure under the quoted provisions of the RTI Act had to weigh against the larger public interest; and, that the Official Secrets Act did not have any provision which allowed the executive to exercise prior restraint from publication. In other words, everyone is free to publish sensitive material, and if, after the publication, it is found violative of the provisions by way of harming national interest or causing harm to relations with other countries, adequate legal steps could be taken against the offender. There appears to be some motive in the Congress camp to discredit the deal and get it scrapped, possibly to benefit a competitor. But, regardless of the brouhaha that has been created subsequent the court’s latest ruling, certain facts remain. The first is that there has been no middleman in the purchase of the aircraft. The second is that it is government to government deal which is above board. The third is that nobody has been able to even suggest, let alone demonstrate, any illegal money trail. The fourth is that there is not an iota of evidence, though there is a great deal of accusations, that one offset partner of the aircraft’s manufacturer, Dassault Aviation, has illegally benefited from the deal as a result of Prime Minister Narendra Modi’s intervention. The fifth is that the Government has on various occasions, through its senior Ministers, clarified the issue in a detailed manner. And the sixth is that there appears to be some motive in the Congress camp to discredit the deal and get it scrapped, possibly to benefit a competitor. Since the matter has become political with the Congress president using the deal to repeatedly call the Prime Minister a thief — one who has stolen from the public sector HAL and given the money to a private player — it must be remembered that, despite the Congress’s best efforts, the Rafale issue has not got traction among the voting public, possibly because they have refused to accept the opposition party’s claim of wrongdoing on the part of the Modi government. Given this situation, it is not surprising that the Congress is looking forward to the court giving it some ammunition as the election campaign gains momentum. An earnest request to Shree Iyer. Please desist your readers to post such uncivilized comments such as above. Such comments will adversely affect the reputation of PGurus. Hope you will take care. 2. If somebody remembers Augusta Westland scam was caught in 1987 also (Italian Sonia forcing RG to buy 21 of these 3rd class Italian helicopters, also called Flying coffins), Pawan Hans was formed to absorb these by RG and SOW-nia..within a year 20 were grounded out of 21..Huge scam was exposed in 1987 itself and RG was forced to BAN Westland for ever doing business in India..HOW AUGUSTA WESTLAND CAME AGAIN IN SONIA-RAHUL UPA Rule? ?